Would You Want to Wallow? 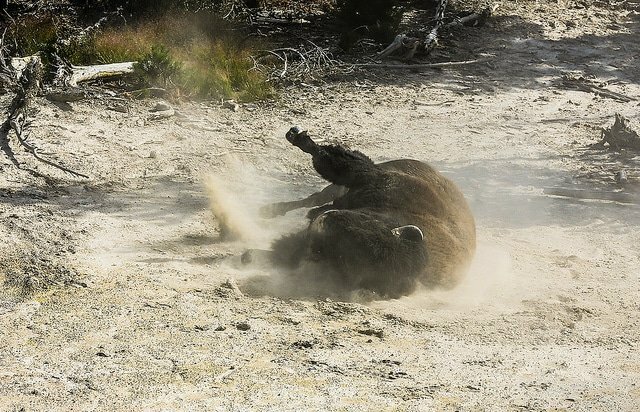 Bison seem to like taking “dust baths” in the silica-rich, dried mud near the Sulphur Caldron in Yellowstone National Park’s Hayden Valley. Of the four bison bulls I observed there on this particular day, all of them took a roll in the fine dust. Wallowing or rolling on the ground is a common bison behavior believed to be for relieving skin irritations, that can result from shedding a winter coat, biting insects or other maladies. A “dust bath” is apparently a good way to stop the itching and chaffing. Has anyone told “Gold Bond”? Buffalos are lucky. They are allowed to wallow without being judged. When I try to wallow, I get a Look. Maybe more than one. If you could wallow without getting judged, what would you wallow about? And I hope you’re weekend is awesome!